To submit to Law School News or to the Digital Screens around campus, or to post a flyer, please review the submission guidelines below. Law School News (LSN) is published weekly during the fall and spring semesters by Law Student Support and is the official newsletter for the School of Law. It is required reading for all law students. For instructions on submitting articles to LSN, please see the Style and Submission Guidelines. Contact the LSN Editors at lawschoolnews@ggu.edu with any questions. For instructions on the flyer approval and posting process, please see the Flyer Posting Policy. 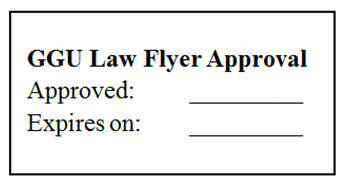 Embed a blank approval stamp image into your flyer, prior to printing and seeking approval. Contact Law Student Support at lawstudentsupport@ggu.edu with any questions or to seek approval. For instructions on the Digital Signage and posting process, please see the Style and Submission Guidelines. Contact lawscreens@ggu.edu with any questions or to submit a screen for posting.